This tart recipe is the product of a perfect Sunday – a day I woke up early, feeling well-rested and with nothing on the calendar aside from hours to spend in the kitchen, tinkering with leftover pate and trying to use up pounds and pounds of tomatoes from the bushes now bursting with fruit in my backyard. At least that’s my idea of a perfect Sunday. If it doesn’t sound appealing to you, you may be in the wrong place. 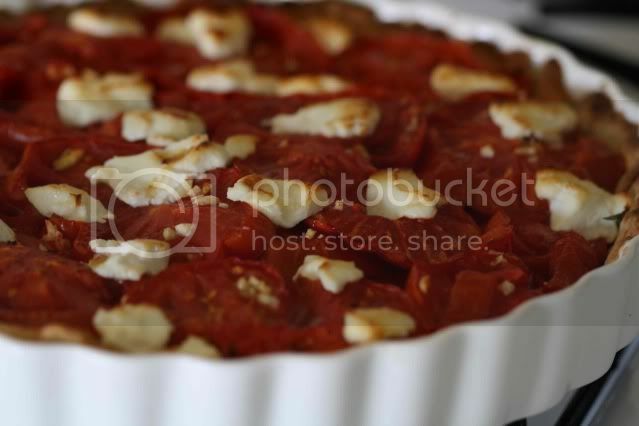 I planned on making a tomato tart to start using up the stockpile of tomatoes currently occupying my kitchen counter. On a whim, I sliced up the leftover pate from our Saturday night cheese plate and included it in the tart. It added an amazing richness, but if you’re not a fan of pate, by all means leave it out, just be sure to put something in its place to help boost the flavor. A slather of Dijon mustard along the base of the tart would be a welcome replacement. Additionally, use any cheese that you like or have on hand. This recipe was created from what was already in the pantry and your version should be too. The following recipe is long enough so I won’t waste anymore of your time going on and on about how much I love the Pâté de Campagne from Monsieur Marcel or how, if you’re feeling particularly adventurous, you can make your own goat cheese for the topping. I’ll just leave you with the recipe for your own adaptation. Enjoy. Place the flour, semolina and salt in a food processor and pulse until combined. Cut the butter into small pads and add to the food processor along with the shortening. Pulse until small crumbs start to form. Pour the mixture into a bowl and drizzle in the water starting with 3 T and adding more, 1 T at a time, if needed until the dough comes together as you stir it with a wooden sppo. Divide the dough into two balls and form into discs. Wrap the discs in plastic wrap and refrigerate for 30 minutes (you will only need one disc for this recipe). While the dough is chilling, slice the tomatoes to a 1/4 inch thick and place on a rimmed baking sheet. 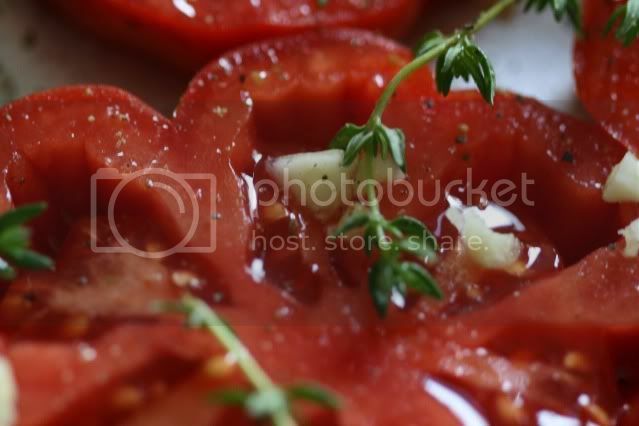 Season liberally with salt and pepper and spread the thyme sprigs and minced garlic over the tomatoes. Drizzle with olive oil and bake for 20 minutes. Remove from the oven, discard the thyme sprigs and allow to cool. Roll the dough out on a floured surface. Transfer to the tart pan and pierce the dough all over with a fork. Chill the dough in the tart pan for an additional 30 minutes. Line the pan with foil and place pie weights in the tart shell. Bake for 10 minutes. Remove the foil and pie weights and return to the oven for an additional 15 minutes. Remove from the oven and allow to cool slightly. Slice the country pate very thinly and lay over the base of the tart shell (the bottom may not be completely covered). Place one layer of tomatoes over the pate, sprinkle lightly with salt and repeat with a second layer. Crumble the goat cheese and spread around the top of the tart. Return the tart to the oven and bake until the edges of the cheese are starting to brown. Let cool slightly before cutting and serving with a simple mixed greens salad. Wow...the tart looks wonderful. We made a similar tart but used asiago instead of goat cheese. I'd be interested to try it with goat cheese. 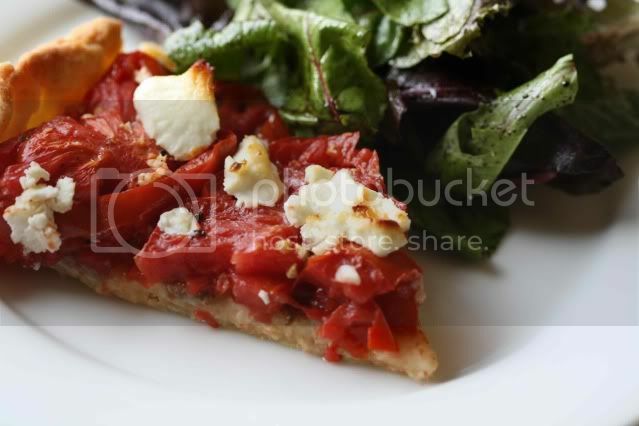 love the combo of tomatoes and goat cheese! looks like summer! I love goat cheese on just about anything. I wish I could take some tomatoes off your hands :) that's a perfect Sunday to me! Mmmmm... this looks delicious. I've been meaning to buy a tart pan for the longest time and this recipe is the perfect excuse to do it. How gorgeous is that! It spells summer. I love those Sundays where there is nothing to do but laze about. Too bad I have only one of them every six months! The tart looks beautiful -- goat cheese is a big weakness of mine! I love the combo of flavors you used here, it sounds fabulous! And your pics are really lovely! You've described the perfect Sunday to me - and your tart looks delicious. I like the idea of using the pate very much. I just love a day when there is absolutely nothing to do but hang out in the kitchen. This tart sounds like wonderful byproduct of a wonderful day. I just bought a basket of juicy local tomatoes. I'm making this tart!! So beautiful and looks so delicious! Great idea with the pate! Are you kidding? OMG That looks so #$%^^$#@ good! A great light summer supper recipe. I'm making it for dinner next week for sure. Thank you. That sounds like an intensely appealing way to spend a Sunday! This is a perfect seasonal tart and I'm definitely going to be trying it. This is a gorgeous tart. Nothing like bringing summer to the table! I love it. That picture up top totally had me drooling... and what an interesting combo! Never would have thought of it.